Somebody tell Tenn D.O.T. how to spell "Cincinnati." This sign is located at the intersection of US 25W and TN 63 at LaFollette. 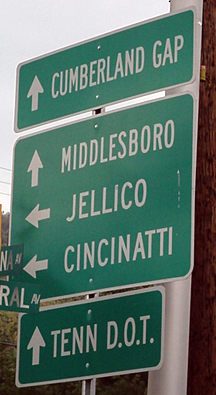 The US 25 sign shown at left, located on TN 160 at Morristown, is incorrect. It should say US 25E, as evidenced by a correct photo at right. 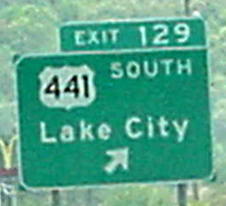 Exit 129 on southbound I-75 at Lake City is not for US 441, but instead is for US 25W. The US 441 exit is actually one mile to the south, at Exit 128. It is signed correctly. At Mountain City, on TN 91, TN 67 is signed as a secondary highway. It's actually a primary highway at that point. 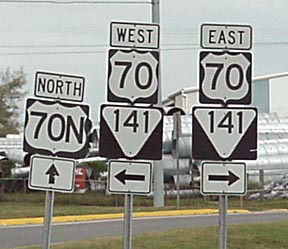 US 70N is an east-west route, not a north-south route as this sign on Business US 70 in Lebanon erroneously indicates. 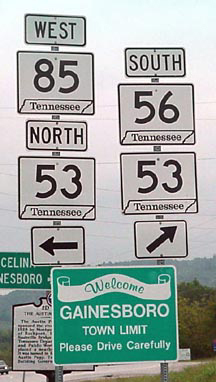 The "West" sign atop the TN 85 marker is incorrect. It should actually be an "East" sign.